Amrinder Gill - Judaa 2 Album Review, Judaa 2 Brand New Punjabi Music Album 2014,Amrinder Gill's New Album Sngs Review From Judaa 2. 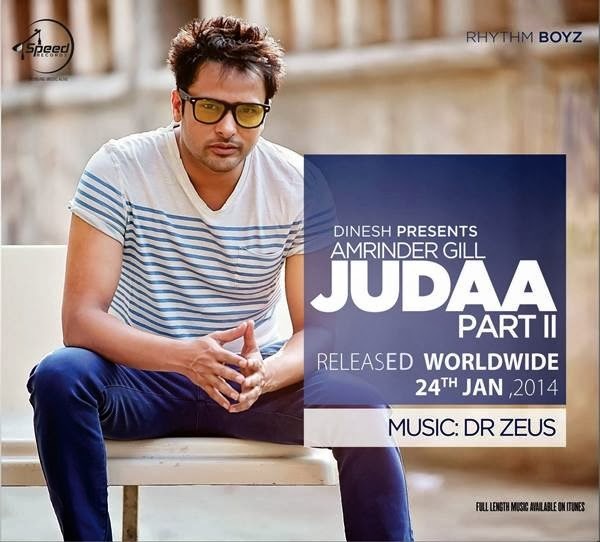 Amrinder Gill Released his album Judaa 2 on January 24th, 2014 worldwide. His Previous album Judaa was released on Envy/Music Waves/Speed Records in 2011 under music production of Dr Zeus. Amrinder has continued with the second volume of same album entitled 'Judaa 2' consisting 8 fresh tracks excluding 2 remixes. Music is awesomely done by Dr Zeus. Mera Deewanapan, first track out from the album with Video is already topping iTunes charts in many countries. Judaa and Diary are two sad numbers in the album. Salera Rang is a beautiful number in folk colors sung on behalf of a girl, mad at her boyfriend for criticizing her skin color. Lyrics of Babul are outstanding, an inspirational song for all the Punjabi daughters. Fateh Doe has performed Rap in two tracks 'Lutti Ja' and 'Pendu'. Overall the album has nothing to criticize. 5 out of 5 From our team.